Is your current Enterprise Resource Planning software capable of properly and accurately tracking your inventory through Lot Tracking methods? Multiple software systems are prone to workarounds and more errors which can hurt the bottom line. Compliance is difficult to achieve, and it adds time to the already time-sensitive product recall process. To understand the power of world class ERP Enterprise Resource Planning Software, sign up for a free, no obligation demo. Maintain a history of traceable items for account ability and customer service follow-up. Keep detailed notes about inspections. Provide reject control and documentation. Trace semi-finished or finished products from the supplier of raw materials through to the customer. Allow the same lot number to be used for multiple stock items. Archive information on traceable items to conserve disk resources. View an on-screen query of current and/or archived data. Accounting - in a single software system. "The importance of true lot tracking has never been more clear." says SCC CEO Gerald Poe. "Not only is it necessary for regulatory compliance requirements, but for product recall purposes, as well." Integrating your business processes in one system. Posting transactions in real time. 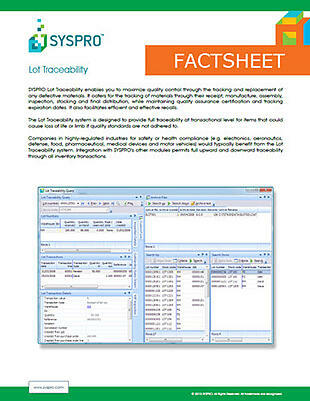 Get the free factsheet by completing the form.